Vancouver, BC (February 10, 2015) - When Grace Fenton, a grade 7 student from Albert Mines, New Brunswick won a PINK SHIRT DAY design competition in 2014, Susan Braverman, President of The Flag Shop, realized that this was the Anti-Bullying symbol her company had been searching for. "We had been looking for an anti-bullying design for over two years and I immediately knew that Grace's design was perfect for us." says Susan Braverman, President of The Flag Shop." It has a positive message that represents helping those who need our help. Grace’s design is simple yet powerful and can be easily understood by everyone." The Flag Shop was honoured when asked to produce Grace's Anti-Bullying flag, which was hoisted for the first time on the flagpole outside her school in February 2014. Later that year, The Flag Shop was granted the exclusive rights to use Grace Fenton's design for the purpose of supporting Anti-Bullying efforts across Canada. The Flag Shop is pleased to introduce the first phase of its Anti-Bullying product line, just in time for Pink Shirt Day on Wednesday, February 25, 2015. More Anti-Bullying products will be introduced before May 4, which is the official Anti-Bullying Day, as declared by the United Nations in 2012. "I am absolutely overjoyed to have found a way for The Flag Shop to make business work for people." says Susan Braverman. "Business is about more than just the bottom line and I want to wake up every morning feeling good about what we do. Bullying is a serious problem, much bigger than people may even be aware of, or are willing to admit. But we can all do our part to raise awareness that bullying behaviour is unacceptable." All The Flag Shop's Anti-Bullying products are available online and at the 13 Flag Shop locations across Canada. Price points have been established to enable Anti-Bullying fundraising initiatives. Partial proceeds from every anti-bullying product sold goes into a fund to support future anti-bullying campaigns. Donation requests for Anti-Bullying products can be submitted at any Flag Shop location. The Flag Shop is proudly Canadian and committed to getting the message across that "EVERY day is Anti-Bullying Day". 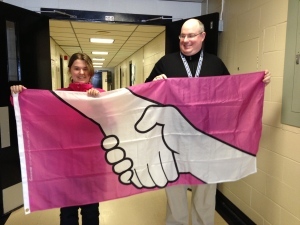 More information about The Flag Shop's Anti-Bullying initiatives and products can be found at www.antibullyingflag.ca.